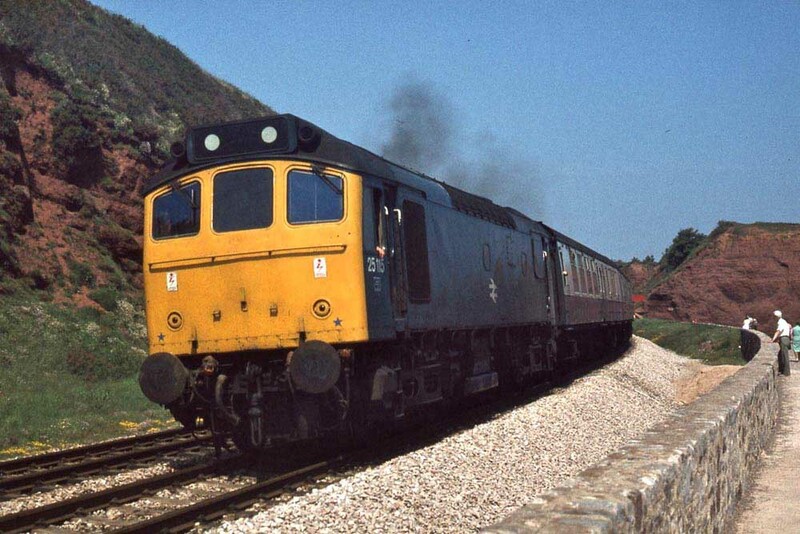 Photograph courtesy Peter Lovell Toton allocated 25115 at Dawlish on June 11th 1979 working the 14.10 Exeter - Paignton. The nineteen and a half year career of D5265/25115 was spent allocated to a variety of London Midland depots. Boiler room grilles sheeted over (1980). Time between last Classified repair and withdrawal: 43 months. Time between withdrawal and scrapping: 26 months. October 1975 to Carlisle (KD). At withdrawal 25115 was stored at Toton between December 1983 & July 1984. It was moved to Gloucester on July 10th 1984 with 25056/090/139 before moving with 25139 to Swindon Works on July 24/25th 1984. 25115 was broken up by the middle of December 1985. Noted Derby Works February 1975 (classified?). Noted Derby Works December 1979 - February 1980 (Intermediate repair). On October 8th 25115 was noted at Edinburgh with the 17.10 to Berwick, however before departure it was replaced by 40065 which was able to heat the train. An ongoing shortage of Type 2s in the London area found any visting Type 2s liable to be pressed into local service, as was 25115 from Springs Branch depot working as the Euston parcels pilot on October 15th and in the Watford area on permanent way work on October 17th. The first recorded passenger workings for D5265/25115 commenced quite late in its career. On July 11th 1978 25115 & 25136 worked a round trip Birmingham New Street - Skegness day excursion, a distance of 317 miles. About a month later on August 9th 25115 was noted assisting the 10.15 Birmingham New Street - Norwich following the failure of 31276. The following week on August 16th 25115 & 25133 worked the 10.25 Nottingham - Glasgow Central to Leeds (assumed). The next day (17th) the same pair worked a roundtrip Nottingham - Southport excursion (for the flower show). The remainder of the workings in 1978 featured Skegness. On August 23rd, 24th, 27th, 28th & 29th 25115 & 25122 worked the 09.53 Nottingham - Skegness and 18.15 return (except on 29th when it is not clear if they worked the outward turn). On 30th the same pair worked a round trip Stoke-on-Trent - Skegness extra. On June 1st 25115 was noted northbound at Duffield with a lengthy train of empty bogie bolsters. The next day (2nd) 25115 & 25209 worked the Derby - Norwich - Yarmouth - Norwich - Walsall diagram. Just over a week later 25115 was noted in Devon, on June 11th working the 11.15 Exeter St. Davids - Paignton and 14.10 Exeter St. Davids - Paignton. Another seaside visit took place on August 4th when 25115 worked the 07.30 Nottingham - Llandudno Town and 13.00 return. On September 8th 25115 was noted passing Shotton with parcels/newspaper vans headed for Red Bank sidings. 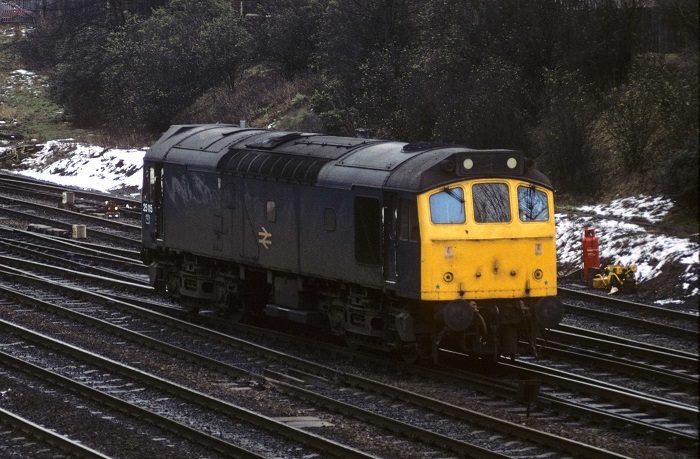 Photograph courtesy Roger Geach 25115 passes York Holgate on February 16th 1980. 25115 was noted at Derby on April 9th. 1980 brought more visits to Yarmouth and Llandudno Town. On June 7th 1980 25115 & 25136 worked the Derby - Norwich - Yarmouth - Norwich - Walsall diagram. Several visits to Landudno Town followed, on June 28th with 25134 on a relief trip from Blyth Bridge (returned as empty coaching stock?) and on July 12th & August 9th from Nottingham. A week later on August 16th 25115 was working the Nottingham - Llandudno Town but only as far as Derby, being replaced by 25270. Its working day was not done however, the 10.55 Weymouth - Leeds arrived at Derby behind 25253 & 25290, they were replaced here by 25115 & 25214 for the run to Leeds. On August 24th 25115 & 25080 worked a roundtrip (presumed) Wellingborough - Llandudno Town day excursion, a total of 366 miles. The next day the same pair worked the return leg of a Southport - Burton on Trent day excursion. 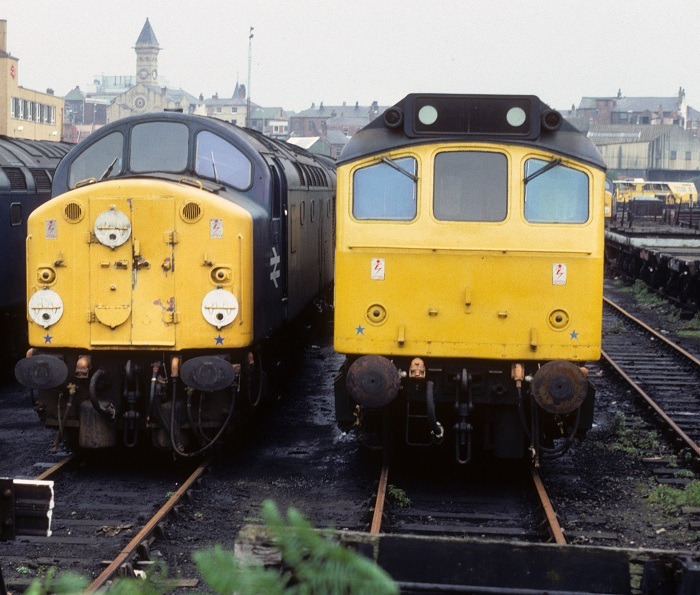 Photograph courtesy Roger Geach 40009, 40016 & 25115 at Ladywell sidings, Preston on September 20th 1980. Also present were 25121 & 25272. On the previous day (19th) 25115 had been noted at Hellifield with a ballast working. From July 15th to July 22nd 1981 25115 & 25158 were on Motorail duty from Kensington Olympia to the Willesden area (?). A month later on August 15th 25115 & 25126 worked the Derby - Norwich (for Yarmouth) - Derby diagram whilst the next day (16th) the same pair went out on the 08.21 Leicester - Skegness and 18.30 return. On August 24th 25115 & 25167 were noted northbound at Gloucester with a mixed freight. On March 22nd 25115 was noted at Wrexham with a short parcels train. On August 3rd 25115 was the Manchester Victoria banking locomotive. The last recorded passenger workings for 25115 took place in 1982, after transfer to Cricklewood in November 1982 passenger workings would be more difficult to come by. On August 12th (presumed) a diesel multiple unit failure led to 25115 working the 16.24 Llandudno Town - Blaenau Ffestiniog and the 17.48 Blaenau Ffestiniog - Llandudno Town. On August 16th 25115 worked a Holyhead - Crewe service. On the following two days (August 17th & 18th) 25115 worked the 16.24 Llandudno Town - Blaenau Ffestiniog and 17.48 return following a diesel multiple unit failure. On August 20th 25115 was noted at Llandudno Junction with a nuclear flask from off the Blaneau branch. Three days later on August 23rd 25115 worked a relief 15.10 Crewe - Llandudno Town. 25115 was the Manchester Victoria banker on September 18th. The final recorded passenger working was the result of another diesel multiple unit failure, on October 5th 1982 working a Chester - Manchester Victoria service. 25115 was stabled at Ebbw Junction on May 27th, this location normally stabled a handful of shunters and Class 37s on engineering work. 25115 was withdrawn on October 2nd 1983. No.2 cab front: centre lampbracket present, other fittings removed. Page added March 22nd 2013.